[HERT441] Richard II (born c.1086-90) son of [BRIO431] Gilbert FitzRichard, see HASTINGS (EU) FEUDAL LORDSHIP). Lord of Clare (Suffolk), Lord of Tonbridge, married [BAYE349] Adeliza (daughter of Earl Ranulph, see CHESTER (BAYEUX) EARLDOM). Richard was slain in a surprise attack by the Welsh near Abergavenny (15th April 1136), and afterwards Adeliza was rescued from the Welsh by Miles of Gloucester. Afterwards, Adeliza married 2. [COND341] Robert de Condet of Wicklambreux (see CONDET). [HERT453] Adeliza de Tonbridge (daughter of Richard de Clare) married (before 1136) [PERX351] Baron William II of Topcliffe (see PERCY). [HERT451] Roger (born 1116, son of Richard FitzGilbert) married 1. Mabel de Clare; then 2. [HILA379] Maud (daughter of James, see SAINT-HILAIRE DU HARCOUET). Roger became 2nd Earl of Hertford (1152), succeeding his elder brother, Gilbert de Clare, the 1st Earl, who died unmarried. Roger died 1173, and afterwards Maud married 2. [ARUN371] Earl William (see ARUNDEL (AUBIGNY) EARLDOM). [HERT462] Aveline (daughter of Roger & Matilda of St-Hilaire) married 1. William de Muchansey (died 1204); then 2. (1205) [FPI2389] Earl Geoffrey FitzPeter (see ESSEX (FITZPIERS) EARLDOM). [HERT464] Eleanor de Clare (born c.1137, daughter of Roger & Mabel) married [GREC431] John de Grey (see WILTON (GREY) BARONY). 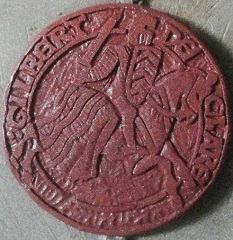 [HERT461] Richard de Clare (born 1162, son of Roger) married [GLOU462] Amice (daughter of Earl William, see GLOUCESTER (FITZROY) EARLDOM). They appear to have separated, perhaps pending a dispensation, prior to 1200. Richard became 3rd Earl of Hertford (1173), and died 1217. By the death of her sister, Countess Isabel, (October 1217), Amice became sole heir of her late father, the 2nd Earl, and appears to have known as Countess of Gloucester up to her death (January 1224-25). [HERT472] Maud (daughter of Richard) married [ABER382] William de Braose (see ABERGAVENNY (BRIOUZE) BARONY). [HERT471] Gilbert (born c.1180, son of Richard) married (at Tewkesbury Abbey, October 1217) [MARS382] Isabel (daughter of Earl William, see PEMBROKE (MARSHAL) EARLDOM). Gilbert became 4th Earl of Hertford (1217), and was also recognised as being 4th Earl of Gloucester (1217). 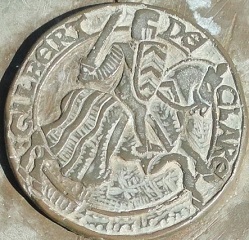 Gilbert was also 1st Lord of Glamorgan and 7th Lord of Clare. Gilbert fought on the side of Dauphin Louis of France at the Battle of Lincoln (19th May 1217), and was taken prisoner by William, 4th Earl of Pembroke, whose daughter Isabel he married shortly afterwards. He joined his brother-in-law, the new Earl Marshal, in an Expedition to Wales (1223). He led an army against the Welsh (1228), was captured by Morgan Gam, but released the following year. Whilst engaged in an expedition to Brittany, he died on the way back at Penros, in that Duchy, (25th October 1230). His body was brought back by way of Plymouth and Cranbourn to Tewkesbury Abbey, where he was buried. Afterwards, Isabel married 2. (at Fawley, Bucks, March 1231) Richard, 1st Earl of Cornwall, (2nd son of King John). Isabel died of jaundice at Berkhamsted (17th January 1239-40). [HERT481] Richard (born 4th August 1222) married 1. Margaret (daughter of Herbert de Burgh, Earl of Kent), who died November 1237; then 2. (c. January 1237-38) [LINC412] Maud (daughter of Earl John, see LINCOLN (LACY) EARLDOM). Richard became 5th Earl of Gloucester & Hertford (1230). Richard was engaged in an Expedition against the Welsh (1244-45), and he was Knighted in London (June 1245). He went on a pilgrimage to St. Edmund at Pontigny (1249). He rebuilt the castle at Tonbridge, the Gatehouse being completed in 1260. He died at John de Criol's manor of Ashenfield in Waltham near Canterbury (15th July 1262), it being rumoured he had been poisoned at the table of Piers de Savoy. He was buried firstly at Tonbridge, Canons Church, then afterwards at Tewkesbury Abbey. Maud died between 1287-89. [THOM491] Thomas (born c.1245, younger son of Richard & Maud) married [OFFY392] Juliana (2nd daughter & eventually sole heir of Sir Maurice FitzMaurice, Governor of London, Lord Justice of Ireland, see OFFALY LORDSHIP). Thomas became Lord of Thomond in Connaught. Thomas died 29th August 1287, and afterwards Juliana married 2. Lord Adam of Stockton; then 3. (1296) Sir Nicholas Avenal. [THOM502] Margaret (born c.1287, 1st daughter of Thomas) married 1. Gilbert de Umfreville (died 1303; then 2. [NORT501] Lord Bartholomew (see BADLESMERE BARONY). [HERT491] red Gilbert [so named from the fiery colour of his hair] (born at Christchurch, Hants, 2nd September 1243, son & heir of Richard & Maud) married 1. (1253) Alice (daughter of Count Hugh XI le brun of La Marche), divorced July 1271; then 2. (at Westminster Abbey, 30th April 1290) [PLAX419] Joan of Acre (see PLANTAGENET KINGS), who was born in Palestine. Gilbert became 6th Earl of Gloucester & Hertford (1262). Gilbert led the massacre of the Jews at Canterbury (April 1264), as Simon de Montfort, 6th Earl of Leicester, had done at London, following which his castles at Kingston and Tonbridge were confiscated by King Henry III. Gilbert and Montfort were both denounced as traitors, but Montfort Knighted Gilbert. The next day Gilbert commanded the second line at the Battle of Lewes (14th May 1264), where fell about 10,000 men. Gilbert took King Henry III prisoner, having hamstrung his horse. As Prince Edward (the future King Edward I) had also been taken, Gilbert and Montfort were now supreme. Later young Edward escaped, and Gilbert and Montfort were proclaimed to be rebels. In 1265 some of the barons broke their allegiance with Montfort. Edward and Gilbert now joined forces and entered on an active campaign against Montfort, and Gilbert destroyed ships at Bristol and the bridge over the Severn to prevent Montfort's escape. Gilbert shared Edward's victory at Kenilworth (16th July 1265), and at the ensuing Battle of Evesham (4th August, in which Montfort was slain), Gilbert commanded the 2nd division and contributed largely to the victory. It is recorded that on 11th April 1268 Gilbert commenced work on the building of a new castle at Caerphilly. There were initial setbacks, as the Welsh forces saw it as a threat to them, and there began a lengthy dispute. Prince Llywelyn lost patience with the delays and attacked and burnt the rising fortifications in October 1270. A furious Gilbert took immediate reprisal action, and on 1st June 1271 began again the construction of the castle. King Edward I stepped into the dispute and sent in two bishops to arbitrate and take control of the castle on behalf of the crown. In February 1272 the Constable of Cardiff Castle accompanied by two knights obtained permission to enter the castle to make an inventory of arms and stores. Once inside, the knights left open the castle gates. Forty of Gilbert's men-at-arms entered the castle and evicted the bishops. When summoned to explain, Gilbert denied all knowledge of the plot, and cloaked the events in such a way that the king was forced to accept. The castle was completed during Gilbert's lifetime. Gilbert was present at Berwick when Robert de Brus surrendered his rights to the Scottish crown (7th November 1292). He died at Monmouth Castle (7th December 1295), and Joan afterwards married 2. (1297, clandestinely) [MONH501] Ralph (see MONTHERMER BARONY). She died April 1307, age 35. [HERT502] Margaret (born c.1292, 2nd daughter of Gilbert & Joan) married 1. Piers de Gaveston, 1st Earl of Cornwall (executed 1312); then 2. [GLO2501] Earl Hugh (see GLOUCESTER (AUDLEY) EARLDOM).